Decorating Christmas trees is a popular and enjoyable Christmas tradition along with decorating homes for Christmas. So, when it comes to buying Christmas trees, we have two options- either buy a real one or get an artificial Christmas tree. Real Christmas trees do bring the charm and smell of holidays to your home, but they are also unmanageable and make a huge mess. Plus they dry out, so it’s not possible to keep them for next year, while an artificial tree is an investment which you can put in storage and bring it out next holiday season. Plus, you will be saved from drawbacks of real trees like browning of fir or pine needles, allergies, and others. Plus, the best of today’s artificial trees look so real that you can’t differentiate whether it’s artificial or real. Most artificial trees come pre-lit(lights already strung around them) so you don’t need to worry about them and just have to focus on other Christmas tree decorating ideas. Buying a high-quality Christmas tree is important, as it makes sure that they can handle under the weight of ornaments and other decorations. Higher quality trees look more like a real thing and are a one-time investment as they last longer. So, whether you’re looking for a simple tree or a unique eye-catcher, there’s an artificial Christmas tree for you. While this simple and standard-sized tree may not be as flamboyant as the other options, it’s a reliable blank slate. This seven-and-a-half foot hinged tree comes with easy-to-fluff branches. Covered in 1,346 tips, this artificial spruce looks better than the real thing. Add to that, the classic silhouette which looks timeless in just about any setting. Beyond the looks, it’s pretty easy to assemble this three-piece tree and it took hardly 20 mins to get the full-bodied fluffy look. Once you put some effort into plumping out the branches, you will be blown away by the quality and design of it. This Amazon’s choice spruce ticks all the areas of quality, look, and budget. It’s a great option to go with if you want a standard tree which you can completely deck out for the holidays. With the rating of 4.3/5 on Amazon y more than 700 customers, you cannot go wrong with this tree. The pencil-thin shape of the Kingswood Fir makes it a great tree for display in tight corners and small spaces. Featuring hinged branch construction, this tree assembles quickly and is ready for decoration. This tree breaks apart into three pieces for easy storage, and the 30-inch circumference makes it great for small spaces. Out of the box, at first sight, it looks a little bare, but take the time to fluff it and it won’t disappoint you. Rated 4.2/5 by more than 500 customers and at an affordable price point , this tree is a perfect choice if you have a limited space. This easy to fluff 6-foot tree is an Amazon bestseller. With lusciously full branches, 1000 branch tips and a hinged, metal construction for easy set-up and storage, this tree is a holiday favorite in a slightly smaller size. At first sight, it looks slightly disappointing, but you will be thrilled at results when you fluff it deliberately and correctly. Now, this tree by no means could be mistaken for a real one, but it is perfect if you just want a decent looking tree without a high price tag. Easily available on Amazon, this is a perfect low budget medium sized tree. When it comes to decorating your space for the holidays, there’s nothing more wonderful than a big—and beautiful—tree. This Balsam Fir tree from Balsam hill ranks highest in the large tree category and is simply stunning. Balsam Hill is known for creating the most luxurious and realistic artificial Christmas trees. And this one is no exception. Their trees look highly realistic compared to competing styles. Their trees are made with a unique True Needle technology to mirror the look and feel of genuine evergreen branches and look 20% more fuller than other artificial needles. Backed by a 3-year warranty, their 9-foot choice comes pre-lit with 1350 clear LED lights and 8472 branch tips. Given its high price tag, it’s comforting to know your investment is backed by an extra guarantee. Starts from $499 for the 5.5 feet variant on Amazon. Pre-lit trees can be a real time saver as you just have to plug it in, and voila! This pre-lit tree from National Tree stands 7.5 feet tall, is 58 inches around, and comes with 750 dual color lights. No matter the room you place it in, it’s prepped to make a big impact. With more than 1,899 branch tips in all, and featuring the company’s Feel-Real technology the tree looks lovely. While it does look flamboyant, it’s quite difficult to set up and fluff this tree but once you do it makes a stunning sight during the holidays. Due to dual color lights, no one has to sacrifice a style preference. You can have it blinking all white or all color, all white the whole time, all colored the whole time, all white fading in and out softly, all colored fading in and out softly. You can have it blinking while alternating between white and colored. So, there’s something for everybody and you can just have a variety if you want. What more, it’s easily available and delivered to your home from Amazon. A limited space doesn’t mean you can’t put up a Christmas tree that will make a big, festive splash. This 3 feet tree from Nearly Natural is mighty pretty and can fit nicely in a small corner or even on a tabletop. If you want a tree to put up in your kid’s bedroom, this is a great option. Best of all, it’s already decked out with 100 lights so you just need to plug it in and watch it glow. Made of more than 130 faux pine tips, the tree is also peppered with pine cones for a rustic feel which makes it look realistic. While the pine cones are a little fragile, customers say overall the tree is well made, easy to set up, and worth the price. It really adds Christmas spirit to their small space. Here’s another amazing Christmas Tree that boasts many amazing qualities like the branch tip technology which makes it look authentic. On top of that, the branch tips are crush-resistant which will make it last longer. For added flair, it’s pre-strung with 1500 clear lights that are resistant to bulb burnouts. Even though it does come at a higher price point than other options on this list, but the quality and features make it worth the price. Did I mention, it runs much larger—nine feet tall to be exact. The most talked about asset of the tree among reviewers is how stylish and life-like it looks. So for those taking the first stab at an artificial option—and have the space to fit a big one—this Fraser fir should be held in high consideration. Another beauty, this unlit 7.5-foot Christmas tree looks so realistic with Balsam Hill’s PE True Needle™ tips for realism and PVC Classic Needles for fullness. If that’s not enough, it is backed by a 3-year warranty. Composed of 5768 branch tips, this tree does take time to set up but looks beautiful after completion. This Frosted Berry Pine tree looks amazing even without adding a single touch. Clad with 1000 clear lights, built-in berries, snowy Everest needles, and pinecones, this 9-feet tree delivers an elegant pine design that looks like it belongs outside. Plus, the frosting on each of the branches adds an authentic extra touch. Customers say that guests at their house commented on the trees unique beauty and how it enhances the rest of their decorations. With free shipping and a comprehensive return policy from Amazon, you have nothing to lose going with an artificial option that mirrors something straight out of nature. Loaded with decoration ornaments, this beautiful white Christmas tree makes decorating easier. And you can spend more time with your families instead of rushing to buy tons of decorations. Their non-toxic, crush and fade resistant needle will stand the test of time and resembles a natural tree. Overall, it’s a complete package at an affordable price. This is seriously the most beautiful artificial tree I’ve ever seen and it comes with ornaments to make decorating much easier. Along with crush and fade resistant needles, this tree will surely stand the test of time. The Rose gold and Champagne pair together gives a sweet, feminine, and classy look for your home. Customers say the ornaments look like they are made of glass (they are made of plastic) and are shatterproof. Given it comes with ornaments, you don’t have to rush to buy decorations and can instead spend the time with your family. 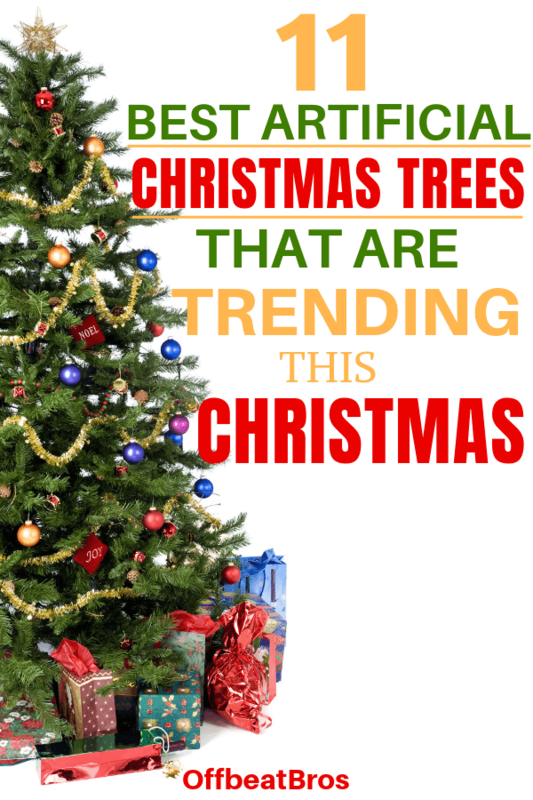 If you like our artificial Christmas tree ideas, please share the post!